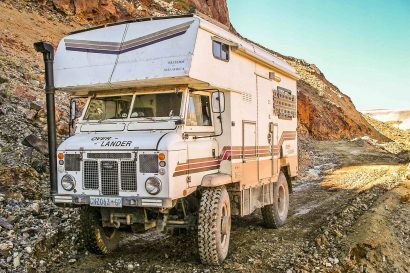 Editor’s Note: This article was originally published in Overland Journal, Summer 2017. Adventure doesn’t always look like what you would expect. 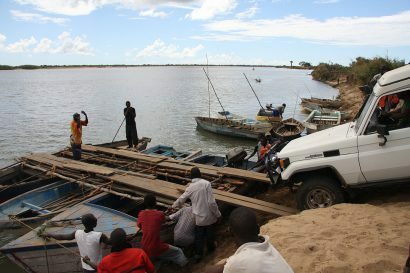 It is not bound to the toughest trails or limited to foreign lands with unfamiliar cultures. Some journeys are about rediscovering the places we already know and seeing them in a new light. 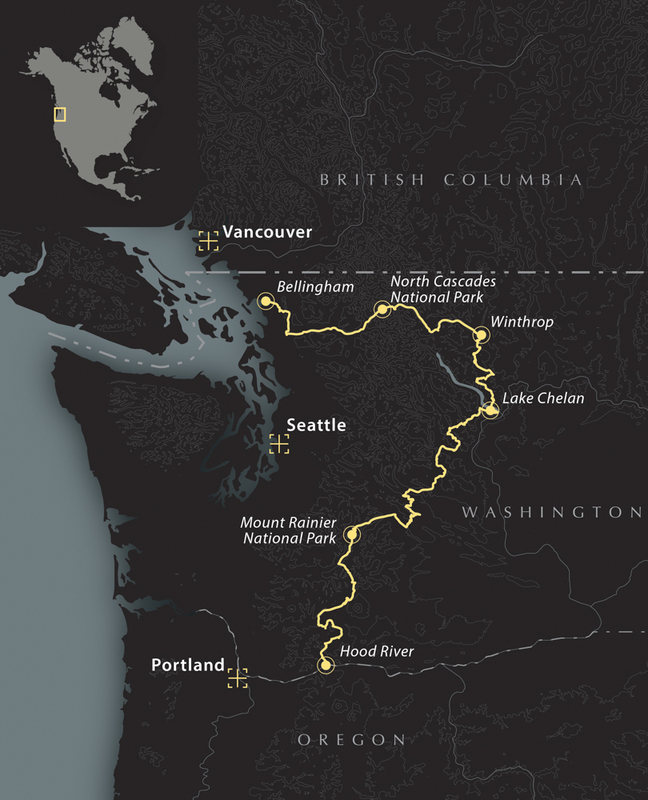 This was our goal with the Washington portion of the Pacific Crest Overland Route (PCOR)—to experience the unique beauty of its small towns and backroads, from the shores of Bellingham to the Oregon border. In truth, we only had time to experience a fraction of the things we had hoped for, but if you choose to explore this route for yourself, it is easy to branch out and see more of the state’s many wonders. Washington is the northwesternmost state in the contiguous U.S. and contains over 71,000 square miles of stunning topography. Although there are many subtle shifts in climate and terrain, the state is largely divided into two sections by the Cascade mountain range. To the west of these picturesque peaks are dense rainforests, lush hills, and many fjords and waterways. It is the iconic terrain of the Pacific Northwest, and a staple of Washington’s landscape. The region east of the Cascades is more arid, and experiences both hotter summers and colder winters. The result is significantly different terrain, which includes vast grasslands and semi-arid steppes. Unofficially nicknamed the Evergreen State, it should come as no surprise that over half of Washington’s landmass is covered in forests. 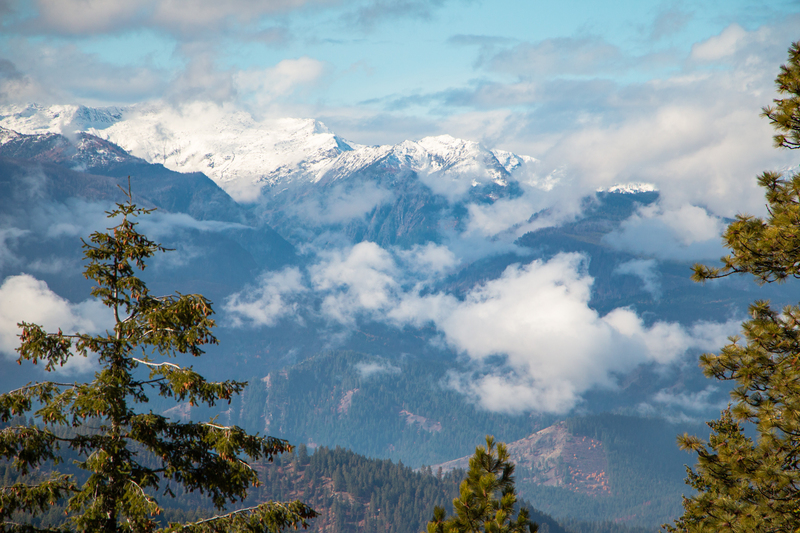 Along the Pacific side of the Cascades, you’ll find pine, fir, hemlock, cedar, spruce, maple, and aspen trees, along with numerous ferns and smaller plants. In the eastern part of the state, there are smaller types of flora like sagebrush, grasses, barleys, and desert flowers, with just a smattering of trees like ponderosa pine, cottonwoods, and white oaks. In total, over 3,100 species call this place home, and that is just the plants. Animals are equally prevalent with around 1,000 species of mammals, birds, fish, and reptiles, among them large predators like grizzly bears and orcas. There are also populations of elk, deer, gray whales, wolves, moose, beavers, raptors, gulls, waterfowl, otters, and even puffins. If you enjoy wildlife, this is certainly a place you’ll want to explore. Our journey through Washington began in the port town of Bellingham. This is the jumping-off point for those taking the ferry system to or from Alaska and offers a variety of outdoor activities. It is also just an hour and a half north of Seattle, the state’s largest metropolitan area. While we do not usually recommend going out of your way to visit a city, the Seattle– Tacoma area provides a dose of urban perspective for those about to explore the less-populated locales. Visitors can try new foods, stop by one of the many beautiful parks, or even explore the Pike Place Market which has fresh fish, loads of handmade goods, and yes, the original Starbucks. Once you’ve had your fill, head east toward North Cascades National Park, following the banks of the Skagit River. The smooth tarmac of the Skagit Highway winds gracefully around each bend and curve of the river, often shaded by a thick canopy of leaves growing overhead. This relaxing drive only gets better as the valley occasionally widens and orchards appear on both sides of the road. We were fortunate enough to pass through this section in fall, and stopped to enjoy a hot cup of coffee amongst the bright orange pumpkins and turning leaves. When you reach the park, you will find a 789-square mile preserve packed with mountains, glaciers, and crystal blue lakes. The views are matched by few others in the world…or so we are told. Unfortunately, our team never saw these epic peaks, as rain and fog obscured them from sight. Should you experience the same misfortune, don’t despair, continue east to the quiet town of Winthrop. Besides marking the beginning of dirt roads heading south, Winthrop is a key fuel stop and a great place to take an afternoon for biking, fishing, or hiking. Once you’re done, warm up with more hot coffee or a fresh pastry at the Rocking Horse Bakery. You won’t be sorry you did. From Winthrop the road heads across a bridge and out of town, climbing into the hills between soft farmland grasses. As the terrain rises it becomes more scenic, with far-reaching vistas to the distant Cascades. 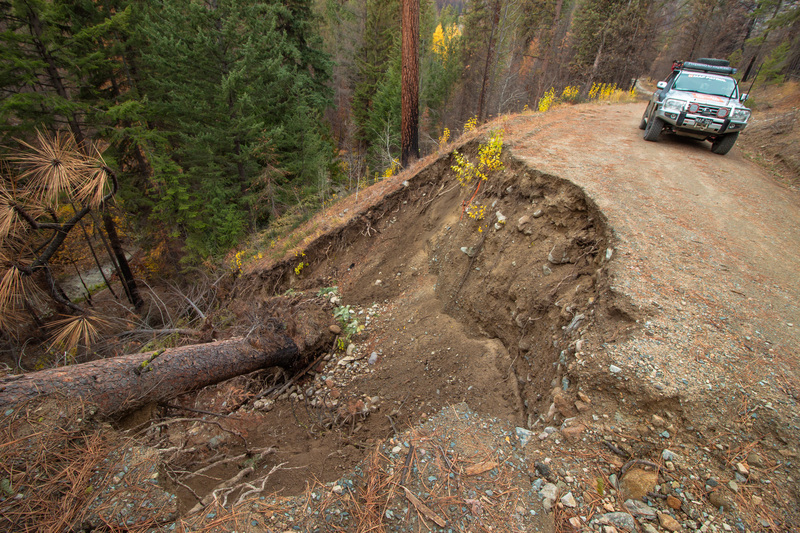 At times it can be a challenge to keep your eyes from wandering to the views surrounding you but be warned, the road is narrow, and the washouts are wide. We ran into several unexpected dead ends where large sections of road simply vanished into the valley below. As you continue south, the trail makes one last climb into the mountains before beginning a slow descent through hillside communities and forests. 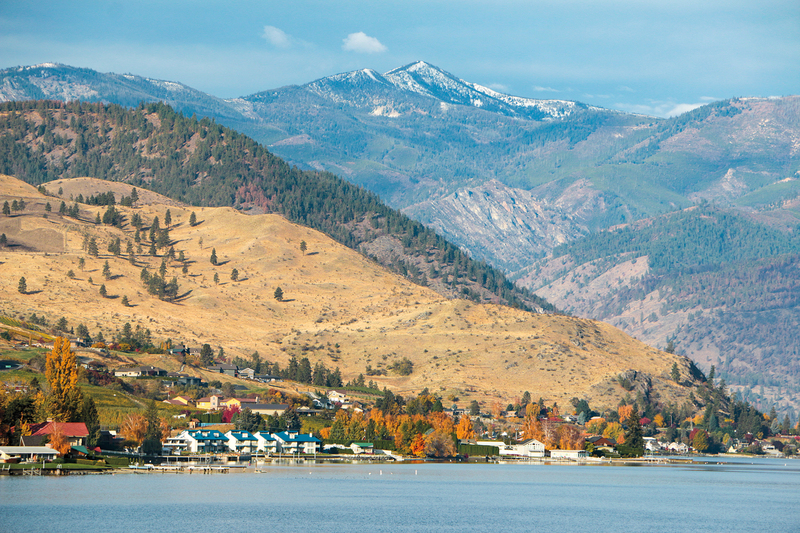 Here there can be snow during early fall and late spring, and the fire-scarred trees present a wide-open view of the road stretching out before you as it curls its way down to Chelan. This beautiful town is nestled at the base of the mountains by a sapphire-blue lake and offers fishing, boating, swimming, and hiking. If you need a break from the road, check out the many local shops or explore their wine region, perhaps with a few tours and tastings. Once you’ve refueled yourselves and your vehicles, the route takes you around the lake before heading south and up into the mountains once more. The paths here are well graded with only an occasional muddy stretch. Soaring peaks cut through lines of passing clouds, trees dot the hillsides, and creeks fueled by snowmelt flow beneath bridges and down into the valleys. At the end of this section lies the pinnacle of the Washington Cascades, Mount Rainier. Sadly, we were robbed of this view too, as more fog and rain rolled in and stayed for the remainder of our trip. Such weather is common in the Pacific Northwest, but there is still plenty to see when the sky is gray. 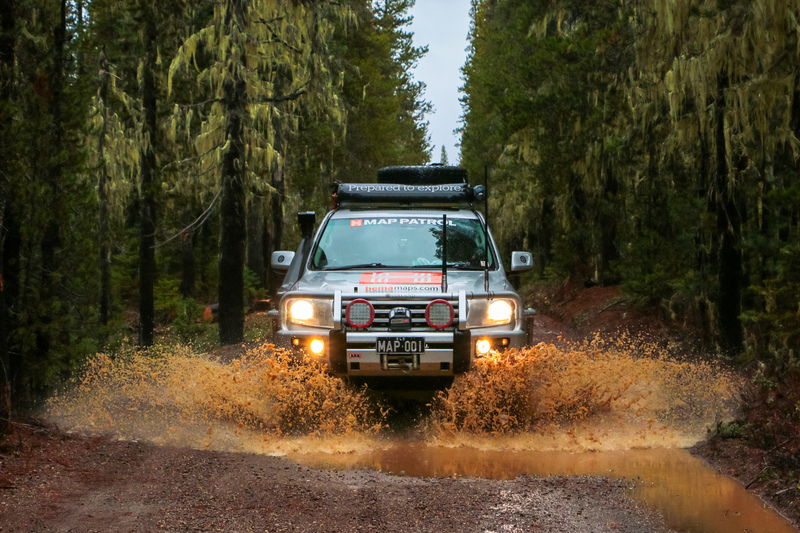 During the final leg, travelers will find themselves plunged into the dense forests that stretch far into Oregon. Unlike the grand vistas of the northern section, the scenery is presented in brief glimpses between trees. Heavy fog often flows down the valleys like a great gray river breaking on cliff walls like waves on rock. It’s an entrancing place, but one that seems to distort both time and space as you pass tree after tree without seeing the sun or any landmarks by which to judge distance. It’s as if you’ve been swallowed by an endless sea of green, right up until you break free at the flowing waters of the Hood River. Here, drivers are faced with the hardest part of their trip: head home, or continue into Oregon on the PCOR. NORTH ENTRANCE From Interstate 5 outside Bellingham, Washington, take the exit for Lakeway Drive and head east. After 2.8 miles, continue onto North Terrace Avenue/Cable Street until the road curves right along the shore of Lake Washington. Proceed on route. SOUTH ENTRANCE From the Lewis and Clark Highway, take the exit for Sprague Landing Road/Wind River Highway. Travel north for 5.7 miles until you reach Old State Road. Turn right, and then proceed for 200 yards before turning left onto Panther Creek Road/Forest Road 65. The Washington portion of the PCOR is considered easy, but there are a few sections with mud or snow that can pose problems. Be sure to check road conditions before you leave and bring proper recovery gear. Summer or fall is the best time to visit Washington. While the summer may have an abundance of mosquitos and other bugs, the warm weather and dry roads will be well worth it. Fall is cooler, even cold at times, but witnessing the vibrant colors of the season will be your reward. This route is largely impassable in winter due to road closures and deep snow, so plan to visit no later than the end of September. 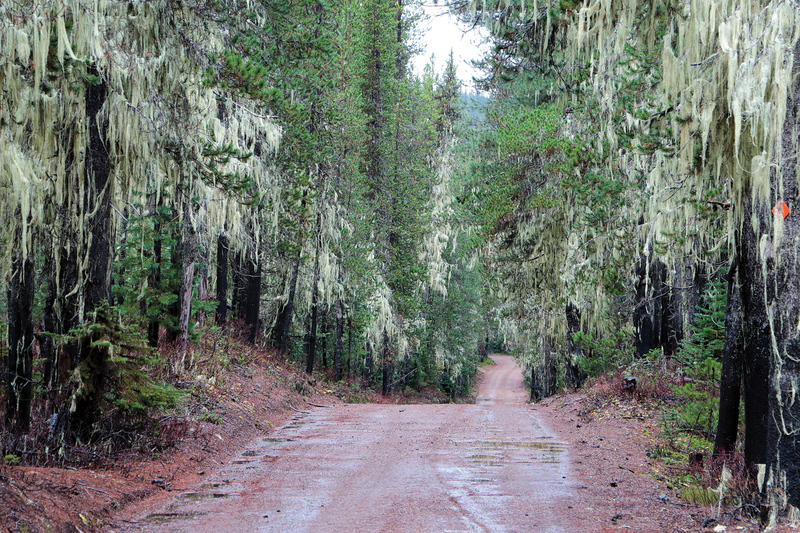 As much of the PCOR is comprised of public roads there are no required permits and fees. Travelers wanting to visit the national parks along the way will need to purchase access passes at the gates. There are simply too many dispersed and maintained sites spread across Washington for us to pick just a handful, so instead, we suggest referencing the Washington State Parks’ website at washington.goingtocamp.com. Many of these campgrounds are seasonal only, so travelers planning to take the trip in late fall or early spring should contact the park service ahead of time to ensure their intended stops are open. We recommend the Benchmark Maps Washington Atlas, as well as seeking out a few travel guidebooks. Our route samples only a small portion of this state’s offerings, so these tools will help tailor the trip to your interests. As always, our team’s GPS track and points of interest are available through the Hema Explorer Cloud (cloud.hemaexplorer.com.au/profile/hemaexplorerusa/ 41947). Looking forward to hitting this route, great write up! I believe you intended to say Columbia River or refer to the town of Hood River, OR. Might check your directions, last time I was in Bellingham the lake was named Whatcom. Do you think I could do this in my Subaru Outback? I bet you could go do this in your Outback. This is similar to WABDR, but avoids some of the gnarlier parts. Worst case you’ll find alternatives on the way, highway or other dirt roads. I’d recommend getting the tracks for the WABDR as well so that you find more options. You will want to make sure you time this right however. Parts of the route between Cashmere & Chelan will have snow until end of June, and you’d want to do this before the forest fires get too bad in late summer. Great to see an article so close to home, I’m about an hour from the north entrance. Also it would be a great route to take with a break in the middle for the Northwest Overland Expo in Plains, WA in June. It’s just a few paved miles west of Cashmere. That said, and as much as I hate to nitpick the article, there is an error (autocorrect?) in the directions to the north entrance. It reads “continue onto North Terrace Avenue/Cable Street until the road curves right along the shore of Lake Washington” but should read “along the shore of Lake Whatcom.” Lake Washington is between Seattle and Bellevue, about an hour and a half south. Thanks for a great write up about a local attraction! I’m about an hour from the north entrance, that’ll go immediately on the list of things to do. 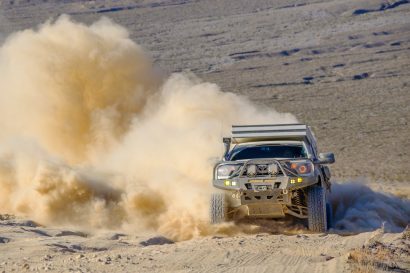 Also, it’s a great route to stop midway for the Northwest Overland Rally in Plains, WA in June. It’s just a few miles on the hardball west of Cashmere. We had a great time last year. Since it involves directions, I do have to point out one error; the directions to the north entrance reads “continue onto North Terrace Avenue/Cable Street until the road curves right along the shore of Lake Washington…” It should say Lake Whatcom. I live in Bellingham and believe you want to be saying Lake Whatcom, Lake Washngton is the long lake separating Seattle from East side where Bellevue is located. Really enjoy your articles and dream of my rig someday on our 2004 Tundra.